High blood pressure (hypertension) was until recently considered to be a blood pressure reading greater than or equal to 140 mm Hg (systolic) or greater than or equal to 90 mm Hg (diastolic). New clinical guidelines define hypertension as pressure greater than 130 mmHg (systolic) or greater than 80 mmHg (diastolic). Systolic pressure between 120 and 130 mmHg with diastolic pressure lower than 80 mmHg is now defined as elevated blood pressure. A blood pressure reading below 130/80 mm Hg should be the minimum goal for most people. People with certain health conditions (diabetes) may benefit from a lower target goal. For elderly people, the risks of medication side effects need to be weighed against the benefits of achieving ideal blood pressure goals. Goals for various populations are constantly being revised as new information about risk is gained from research studies. Your provider can help give you the most appropriate goal. Most people with high blood pressure can benefit from monitoring their blood pressure at home on a regular basis. Home monitoring can help show if blood pressure medications are working or if they need to be adjusted. 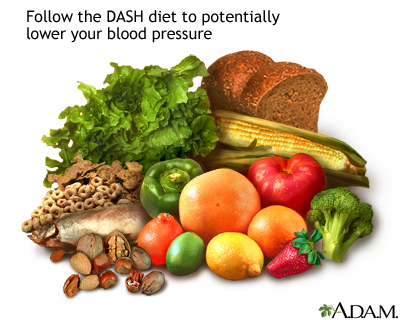 The DASH diet is a plan proven to improve blood pressure. Drug treatment for high blood pressure is tailored to the individual. There are many different types of blood pressure medications. Although some people need only one drug to control blood pressure, many people require at least two medications. Blood pressure measurements can fluctuate throughout the day and in different environments. The decision to start or increase blood pressure medications should not be based on a single blood pressure reading. To obtain the most accurate estimate of your true blood pressure, your doctor will use an average of multiple readings. These may include repeated readings made in the doctor's office as well as blood pressure measurements you performed at home. The heart pumps more blood faster or with excessive force. 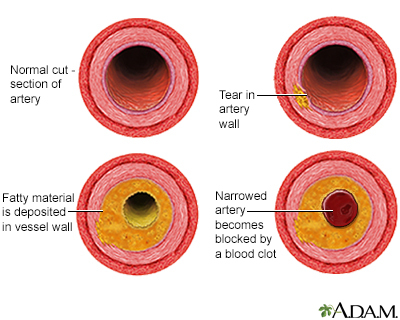 The body's smaller blood vessels (known as the arterioles) narrow or contract so that blood flow exerts more pressure against the vessels' walls. High blood pressure makes the body's heart work harder, which over time can lead to damage to blood vessels throughout the body and to the heart itself. Damaged blood vessels affect function in the heart, kidneys, brain, and eyes. (the first and higher number) is the force that blood exerts on the artery walls as the heart contracts to pump out the blood. It shows the pressure in the arteries when the heart is beating. (the second and lower number) is the measurement of force as the heart relaxes to allow the blood to flow into the heart. It shows the pressure in the arteries when the heart is resting between heartbeats. A third number, pulse pressure, is the difference between the systolic and the diastolic readings. It reflects stiffness and inflammation in blood vessel walls (or sometimes a heart valve problem). The greater the difference between systolic and diastolic numbers, the greater the risk to health. There are a number of ways to categorize or describe hypertension. , also called essential or idiopathic hypertension, is high blood pressure without a known cause. About 90% of all high blood pressure cases are this type. is high blood pressure caused by an underlying medical condition, such as kidney or endocrine disorders. It accounts for about 5% to 10% of high blood pressure cases. occurs when systolic pressure is high (over 130 mmHg) but diastolic pressure is normal (under 80 mmHg). It is related to atherosclerosis (hardening of the arteries). Isolated systolic hypertension is the most common form of hypertension in people older than age 50.
refers to an elevated diastolic blood pressure reading (over 80 mmHg). This subtype is most common in people age 30 to 50. (120 to 129 systolic and less than 80 mmHg diastolic) indicates an increased risk for developing high blood pressure. (hypertension) is greater than or equal to 130 mmHg (systolic) or greater than or equal to 80 mmHg (diastolic). Hypertension is further divided into stages 1 and 2 depending on severity. For children younger than 13, blood pressure readings are based on percentile ranges for a child's age and height. Hypertension in children is defined as average systolic and diastolic readings that are greater than the 95th percentile for gender, age, and height on at least three occasions. After the age of 13, adolescents are considered hypertensive if their blood pressure is greater than 130/80 mmHg. Elevated blood pressure (previously called prehypertension) in children younger than 13 is diagnosed when average systolic or diastolic blood pressure levels are at least in the 90th percentile, but less than the 95th percentile. For adolescents, as with adults, blood pressure readings greater than 120/80 but below 130/80 are considered elevated. Increasing rates of childhood obesity have led to higher rates of hypertension and prehypertension among children and adolescents. However, according to the United States Preventive Services Task Force (USPSTF), it is not clear if blood pressure screening is helpful for children who DO NOT show signs or symptoms of hypertension. It is also not certain if screening accurately identifies children at risk for heart disease. The USPSTF recommends pediatricians make a decision to evaluate blood pressure based on specific clinical situations (for example, when a child is overweight). The American Association of Pediatrics recommends routine blood pressure measurements only at annual preventative care visits. Hypertension is referred to as primary (essential) when the doctor is unable to identify a specific cause. It is by far the most common type of high blood pressure. Primary hypertension may be due to a combination of genetic, environmental, and other factors. These factors influence the function of several complex systems that control blood pressure, the most important of which are the kidneys, the blood vessels, the nervous system, and hormones. Genes that regulate a group of hormones known collectively as the renin-angiotensin-aldosterone system. This system influences most aspects of blood pressure control, including blood vessel contraction, sodium and water balance, and cell development in the heart.
. This is the part of the autonomic nervous system that controls heart rate, heart contraction force, and the diameter of the blood vessels. Secondary hypertension is caused by an underlying medical condition or other factor (such as medications) that elevates blood pressure. Many different medical conditions are associated with secondary hypertension. These conditions can also make high blood pressure more difficult to control. Hypertension is strongly associated with diabetes, both types 1 and 2. Kidney damage (diabetic nephropathy) is generally the cause of high blood pressure in people with diabetes. Kidney disease is the most common cause of secondary hypertension, particularly in older people. In addition to diabetic nephropathy, many other types of kidney diseases can cause hypertension. 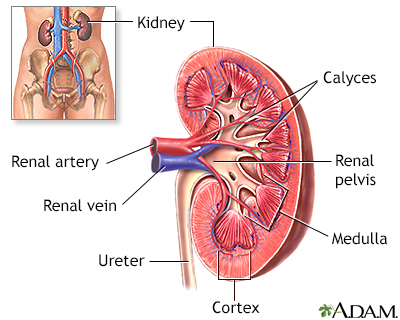 Renal artery stenosis involves the narrowing of the renal artery and is usually caused by atherosclerosis. Other types of kidney disease associated with hypertension are polycystic kidney disease and renal parenchymal disease (abnormalities of the kidney tissue itself). This is a birth defect that causes narrowing of the aorta, the main artery leading out of the heart that brings blood to the rest of the body. This can be a cause of hypertension in younger people and is sometimes associated with other abnormalities. Adrenal tumors (pheochromocytoma, aldosteronism), thyroid disorders, and Cushing syndrome can all cause secondary hypertension. Corticosteroids when given by mouth or intravenously. Nonsteroidal anti-inflammatory drugs (NSAIDs), such as ibuprofen (Advil, Motrin, generic), naproxen (Aleve, generic), and aspirin. Cold medicine decongestants containing pseudoephedrine can increase blood pressure in people with high blood pressure, although they appear to pose no danger for those with normal blood pressure. Oral contraceptives (birth control pills) increase the risk for high blood pressure, particularly in women who are older than 35 years, obese, smokers, have strong family history of hypertension, or some combination of these factors. Stopping the pill nearly always reduces blood pressure. In addition to medications, recreational or illegal drugs (such as cocaine or amphetamines) can also increase blood pressure temporarily and may stiffen blood vessels and contribute to chronic high blood pressure. A few supplements and herbs may also increase blood pressure, including any containing licorice, ephedra, caffeine, guarana, or ginseng. In the United States, nearly half of all adults have high blood pressure. Many people with high blood pressure don't know they have it. People with elevated blood pressure (120 to 129/80 mmHg) are at higher risk of developing high blood pressure. Age is the major risk factor of hypertension. Men over age 45 and women over age 55 are at increased risk for high blood pressure. Over half of Americans over age 60 have hypertension. After age 65, high blood pressure affects more women than men. Hypertension is also becoming more common in children and teenagers. Among younger people, boys are at higher risk for high blood pressure than girls. Compared to Caucasians and other ethnic groups, African Americans are more likely to have high blood pressure. 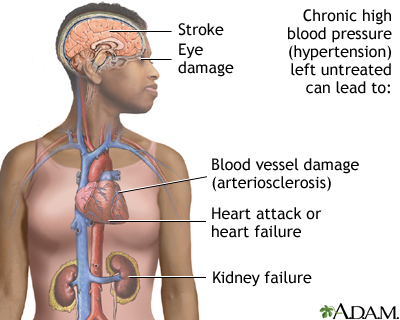 More than 40% of African American men and women have hypertension. (African American women have a higher risk than African American men.) High blood pressure tends to start at a younger age among African Americans, is often more severe, and causes greater risks for premature death from heart attack, stroke, heart failure, and kidney failure. People with parents or other close relatives who have high blood pressure have an increased risk of developing it themselves. About a third of people with high blood pressure are overweight. Even moderately obese adults have double the risk of hypertension than people with normal weights. Children and adolescents who are obese are at increased risk for high blood pressure when they reach adulthood. Obstructive sleep apnea, a disorder in which breathing halts briefly but repeatedly during sleep, is present in many people with hypertension. The relationship between sleep apnea and hypertension has been thought to be largely due to obesity. But studies are finding a higher rate of hypertension in people with sleep apnea regardless of their weight. Cigarette smoking is a major risk factor for high blood pressure. Eating too much sodium (salt) can increase the risk for developing high blood pressure. Similarly, a diet that is too low in potassium has been associated with high blood pressure, which may cause the body to accumulate too much sodium. Low blood potassium and hypertension may be related to another medical condition. Sodium and potassium are important regulators of fluid balance in cells. Chronic heavy alcohol use can increase blood pressure. Women may be more sensitive than men to the blood pressure effects of alcohol. Recreational or illegal drugs including cocaine and amphetamines can also increase blood pressure momentarily or worsen existing hypertension. A sedentary lifestyle and lack of physical activity can increase the risk of becoming overweight. Mental and emotional stress can cause a temporary increase in blood pressure. Chronic stress can lead to engaging in unhealthy behaviors (overeating, smoking, alcohol use, lack of exercise) that contribute to high blood pressure. High blood pressure, also called hypertension, is a disorder characterized by chronically high blood pressure. 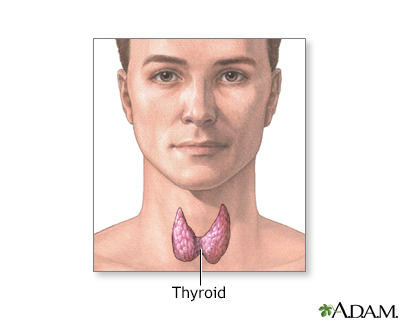 It must be monitored, treated, and controlled by medication, lifestyle changes, or a combination of both. High blood pressure places stress on blood vessels that feed several organs (called target organs), including the kidneys, eyes, and heart. The stress causes these organs to deteriorate over time. High blood pressure contributes to 75% of all strokes and heart attacks. It is particularly deadly in African Americans. 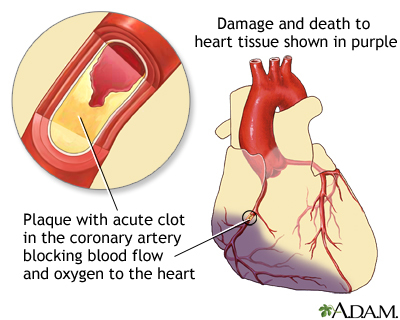 Coronary artery disease (CAD), sometimes called Coronary Heart Disease. High blood pressure contributes to the thickening of the blood vessel walls, and worsen atherosclerosis (accumulated deposits of cholesterol in the blood vessels). The end result is called CAD, also called ischemic heart disease. Th presence of CAD increases the risk for angina (chest pain), heart attack, stroke, and death. High blood pressure is the most common risk factor for heart attack and stroke. High blood pressure increases the heart's workload. Over time, this can cause the heart muscle to thicken (cardiac hypertrophy), which makes it more difficult for the heart to fill with and then pump out sufficient blood. This process can eventually lead to heart failure. High blood pressure increases the risk for cardiac arrhythmias (disturbances and irregularities in heartbeats). Arrhythmias include atrial fibrillation, premature ventricular contractions, and ventricular tachycardia. About two-thirds of people who suffer a first stroke have moderately elevated blood pressure (160/95 mmHg or above). Hypertensive people have up to 10 times the normal risk of stroke, depending on the severity of the blood pressure in the presence of other risk factors. 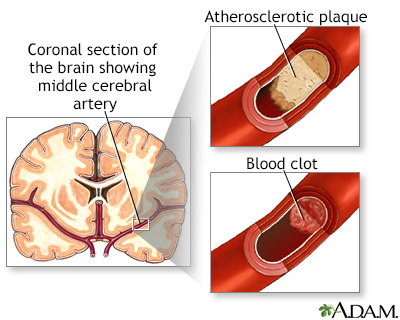 Hypertension is also an important cause of silent cerebral infarcts, which are blockages in the blood vessels in the brain (mini-strokes) that may predict major stroke or progress to dementia over time. High blood pressure, and some of the medications used to treat it, can increase the risk for developing type 2 diabetes. There are strong biologic links between insulin resistance (with or without diabetes) and hypertension. It is unclear if one condition causes the other. The USPSTF recommends screening for type 2 diabetes in all people with blood pressure higher than 135/80 mmHg. High blood pressure causes about 30% of all cases of end-stage kidney disease (referred to as end-stage renal disease, or ESRD). Only diabetes leads to more cases of kidney failure. People with diabetes and hypertension need to be monitored very closely for the development of kidney disease. Isolated systolic hypertension may pose a particular risk for dementia, or memory loss. 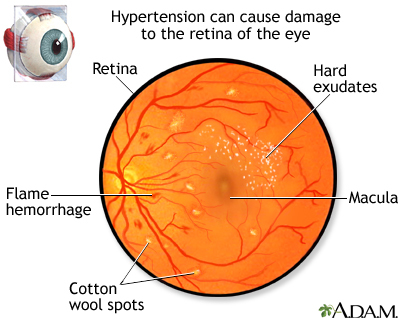 High blood pressure can injure the blood vessels in the eye's retina, causing a condition called hypertensive retinopathy. Sexual dysfunction is more common and more severe in smokers and people with hypertension than it is in the general population. Although older drugs used to treat hypertension can be associated with sexual dysfunction as a side effect, the disease process that causes hypertension is itself a major cause of sexual dysfunction. Oral phosphodiesterase type 5 (PDE5) inhibitors -- such as sildenafil (Viagra), tadalafil (Cialis), vardenafil (Levitra), and avanafil (Stendra) -- DO NOT appear to pose a risk for most men who have both high blood pressure and erectile dysfunction. But men who have uncontrolled or unstable hypertension should not take these medications. Men who take nitrate medications for heart disease cannot take erectile dysfunction pills. Many women who are likely to develop hypertension when they are older have their first elevated blood pressure readings during pregnancy. Elevated blood pressure readings generally show up early in pregnancy, before 16 to 20 weeks, but can first appear at any time during the pregnancy and for up to 6 weeks after delivery. These women often require antihypertensive medications during pregnancy and closer monitoring of themselves and the fetus. Continued hypertension after the pregnancy is also not uncommon, and women who had preeclampsia are at higher risk of developing hypertension later on. Preeclampsia is further discussed below. Severe and sudden high blood pressure in pregnant women is one component of a condition called preeclampsia (also called toxemia) that can be very serious for both mother and child. Preeclampsia occurs in up to 10% of all pregnancies, usually in the third trimester of a first pregnancy, and usually resolves immediately after delivery. Other symptoms and signs of preeclampsia include protein in the urine, severe headaches, and swollen ankles. The reduced supply of blood to the placenta can cause low birth weight and eye or brain damage in the fetus. Severe cases of preeclampsia can cause kidney damage, convulsions (seizures), and coma in the mother and can be lethal to both mother and child. A variant of preeclampsia called HELLP syndrome is a particularly severe complication characterized by hemolysis, elevated liver enzymes, and a low platelet count. HELLP syndrome is a life-threatening condition that usually requires immediate delivery. Women at risk for preeclampsia (particularly those with existing hypertension) are monitored carefully for its presence. Both mother and fetus are monitored closely after a diagnosis. Blood pressure medications may be required. Delivery of the placenta is the main solution for preeclampsia. In severe cases, an obstetrician may need to induce pre-term birth. Delivery does not guarantee that blood pressure will return to normal in all women with preeclampsia and complications can still occur after delivery. In some cases, preeclampsia can even occur for the first time after delivery. All women should be aware of and report symptoms such as severe headache, visual problems, or pain in the upper middle abdomen. High blood pressure increases slowly over the years. It is often called the "silent killer" because it usually produces no symptoms until vital organs are damaged, like the heart, brain, and kidneys. 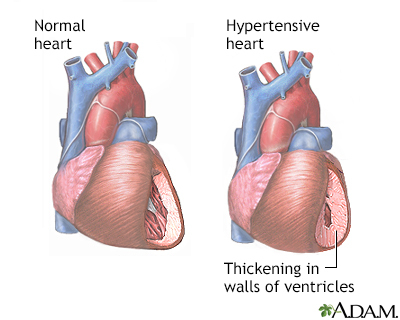 Malignant hypertension is very high blood pressure that comes on suddenly and quickly. The lower (diastolic) blood pressure reading, which is normally around 80 mmHg, is often above 130 mmHg. This rare disorder affects about 1% of people with high blood pressure, including both children and adults. It is more common in younger adults, especially African American men. Malignant hypertension is a life-threatening condition and must be treated immediately. People with uncontrolled hypertension or a history of heart failure are at increased risk for this crisis. Most physical exams at the doctor's office include a blood pressure reading. People should not smoke, exercise, or drink caffeinated beverages within 30 minutes before their blood pressure measurement. Once a year for adults aged 40 years and older. Once a year for people at increased risk for high blood pressure. Every 3 to 5 years, adults aged 18 to 39 years with blood pressure less than 120/80 who DO NOT have other risk factors. , more often referred to as a blood pressure cuff. Measurements are given as units of mercury, which was used to fill the central column in standard sphygmomanometers for many years. Modern devices DO NOT use mercury. While seated with your back supported, and your feet flat on the floor after sitting quietly for several minutes, an inflatable cuff with a meter attached is placed around your upper arm, over the artery. The arm being used for measurement is at the level of your heart. The inflated cuff briefly interrupts the flow of blood in your artery, which then resumes as the cuff is slowly deflated. As the cuff is slowly deflated, the person taking your blood pressure listens to the blood pumping through the artery with a stethoscope. The first pumping sound is recorded as the systolic pressure, and the last sound is the diastolic pressure. If a first blood pressure reading is above normal, the health professional may take two or more measurements separated by 2 minutes with you sitting or lying down. Another measurement may be taken after you have been standing for 2 minutes. If the measurements are still elevated, your health care provider should take blood pressure readings from both arms. Decisions on starting or increasing medications should be based on multiple blood pressure readings, taken at both the doctor's office and even at home. These people may require additional blood pressure monitoring. White coat hypertension may be associated with a higher cardiovascular disease risk. Doctors may ask some people to use a special ambulatory monitoring device for a 24-hour period. The device checks blood pressure about every 15 to 30 minutes during the day and night and provides a read-out of blood pressure measurements for the doctor. Ambulatory monitoring may be used for people who have borderline high blood pressure or for those who have had difficulty keeping their blood pressure under control. It can also help distinguish between true and white coat hypertension and it can detect masked hypertension (readings that are normal in a doctor's office but high during daily life). Ambulatory monitoring can also be helpful for diagnosing children with suspected high blood pressure. The American Heart Association (AHA) recommends that all people with high blood pressure monitor their blood pressure at home on a regular basis. In addition to other benefits, home monitoring can help show if blood pressure medications are working. Purchase a blood pressure monitor with a cuffs that fits on the upper arm. Wrist monitors are not recommended. Make sure that the cuff is the right size. One size does not fit all. Ask your doctor to show you the proper way to use the monitor. Your arm should be supported with your upper arm at heart level, your feet on the floor, back supported, and legs uncrossed, after sitting quietly for several minutes. Don't drink caffeinated beverages, exercise, or smoke within 30 minutes before measuring your blood pressure. Check your blood pressure at the same time each day. Take two or three readings, 1 minute apart, while sitting still. Your doctor may suggest a specific time of day you should take your readings. Keep a record of your readings including the date, time, and systolic and diastolic measurements. (Some monitors have built-in memories to record readings.) When you visit your doctor, take the record or monitor with you. In general, everyone's blood pressure varies throughout the day. In monitoring at home, it is important to note that blood pressure is usually highest from morning to mid-afternoon. Upon waking, blood pressure in most people typically increases suddenly. Early morning is the highest risk period for heart attack and stroke. Blood pressure normally dips to its lowest level during sleep, although some people (particularly postmenopausal women) have a condition called non-dipper hypertension, in which blood pressure does not fall at night. Your family and personal medical history, especially relating to high blood pressure, stroke, heart problems, kidney disease, or diabetes. Risk factors for heart disease and stroke, including tobacco use, salt intake, obesity, physical inactivity, and unhealthy cholesterol levels. (high blood pressure caused by another disorder). Such symptoms include headache, heart palpitations, excessive sweating, muscle cramps or weakness, or excessive urination. Any emotional or environmental factors that could affect blood pressure. If a physical examination indicates hypertension, additional tests may help determine whether organ damage is present. Measuring blood levels of the protein creatinine, for example, is important for all hypertensive people in order to determine kidney damage. 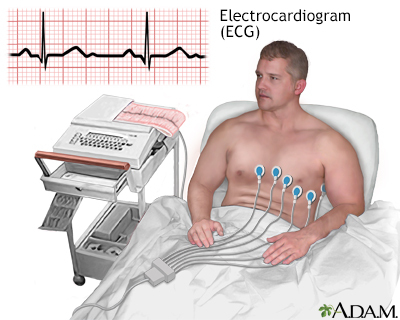 An electrocardiogram (ECG) in the doctor's office. An exercise stress test for people who also have symptoms of CAD. An echocardiogram, when it would help the doctor decide whether to start treatment. Most of the time this test is not necessary for people who have only hypertension and no other symptoms. A Doppler or duplex test to see whether one of the arteries supplying blood to the kidney is narrowed, a condition called renal artery stenosis. An ultrasound to examine the kidneys. General treatment goals for hypertension aim to reduce blood pressure to below 130/80. Specific blood pressure goals may differ depending on a person's individual health profile and risk factors. Lifestyle changes are the first step for reducing blood pressure, and are an essential accompaniment to drug treatment. Lifestyle changes may be the only intervention necessary for elevated blood pressure (systolic blood pressure 120 to 129 mmHg and diastolic blood pressure less than 80 mmHg). Drug treatment for blood pressure control must be individualized. The doctor needs to consider a patient's risk factors, such as age, diabetes, or other heart disease conditions. In some people, a single-drug regimen can control Stage 1 hypertension (systolic 130 to 139 or diastolic 80 to 89) if lifestyle changes (diet, exercise, weight control) are not enough. For people with Stage 2 hypertension (systolic above 140 or diastolic above 90), guidelines recommend two or more medications. A normal blood pressure is below 120/80. High blood pressure is above 130/80. Reducing high blood pressure is essential in prevention of stroke and other cardiovascular disease. This is called primary prevention. In general, most people with hypertension who DO NOT have diabetes or cardiovascular disease should aim for blood pressure below 130/80 mmHg. When stroke, heart disease, or other cardiovascular problems are present, blood pressure control is even more important. This is called secondary prevention. Blood pressure control is also very important for those with diabetes, since their risk of cardiovascular disease is so much higher than in the general population. At the present, the American Diabetes Association still recommends a goal of 140/90 mmHg for people with hypertension and diabetes. Because of potential medication side effects, people with high blood pressure over the age 60 may have different blood pressure goals. For these specific groups, there is not full agreement between different expert groups on blood pressure goals. rid the body of extra water and salt. Thiazide diuretics one of the first-line treatment for high blood pressure. reduce the production of angiotensin, a chemical that causes arteries to narrow. block the action of angiotensin. widen blood vessels and some decrease the strength of the heart's contractions. Side effects can be a problem with blood pressure medications. Some people find that the treatment may make them feel worse than the disease, which usually has no symptoms. Whatever the difficulties, compliance with a drug and lifestyle program is essential. It is very important to discuss any medication concerns with your doctor. If your current blood pressure drugs are causing uncomfortable side effects, your doctor may switch your drug, or adjust your dosages or combinations. Some people whose blood pressure has been well-controlled and who are able to maintain a healthy lifestyle may be able to withdraw from medications. These are generally people with mild-to-moderate (Stage 1) hypertension who have been treated with a single medication. They should withdraw in a step-down manner (gradual reduction) and be monitored regularly. Stopping too quickly can have adverse effects, including serious effects on the heart. 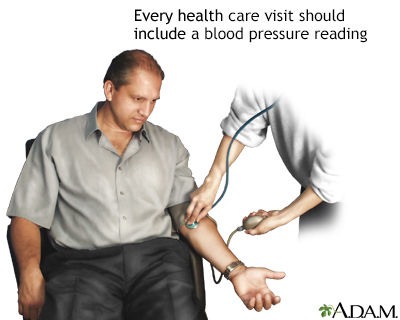 Treating any underlying medical condition is important for helping control blood pressure. People should be sure to adhere to healthy lifestyle changes and may require modifications to their drug regimens. Those with severe resistant hypertension should consult with a doctor who specializes in treating high blood pressure. Older adults should have their blood pressure monitored on a regular basis. High blood pressure is very common in older adults and can be challenging to control. In general, older adults usually have an elevated systolic blood pressure and a normal or low diastolic blood pressure, a condition known as isolated systolic hypertension. Blood pressure drugs prescribed for older people are generally started at the lowest dose and then gradually increased as necessary. 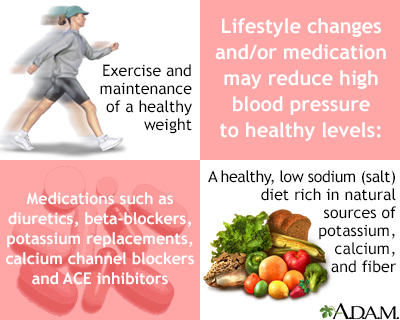 As with all people with high blood pressure, lifestyle changes are an essential component of treatment. Medication side effects are an important concern for older people. In particular, antihypertensive drugs can increase the risk for falls. In treating elderly people, blood pressure targets need to be balanced against drug side effects. Children and adolescents with even mild hypertension should be monitored and evaluated for any signs of early organ damage. Secondary hypertension (high blood pressure due to another disease or drug) is more common in children than adults. If blood pressure is not controlled with lifestyle changes, drug treatment may be required. Exercise at least 30 minutes a day 5 days a week, which is 150 minutes per week of moderate exercise or 75 minutes a week of vigorous exercise. Limit alcohol consumption to no more than one or two drinks a day. In general, everyone should restrict their sodium intake to no more than 2,400 mg a day (less than 1 teaspoon of salt). This is particularly important for people over age 50, all African Americans, and everyone with high blood pressure. The American Heart Association recommends that people with heart disease risk factors limit sodium intake to no more than 1,500 mg a day (about one half teaspoon). Sodium restriction lowers blood pressure and also helps protect against heart failure and heart disease. Salt substitutes such as Nu-Salt and Mrs. Dash are available. But they can be risky for people with kidney disease or those who take blood pressure medications that can cause potassium retention. Look for foods that are labeled low-sodium, sodium-free, no salt added, or unsalted. Check the total sodium content on food labels. Be especially careful of canned, packaged, frozen, and processed foods. A nutritionist can teach you how to understand these labels. Don't cook with salt or add salt to what you are eating. Instead, try pepper, garlic, lemon, or other spices for flavor. Be sure to read the ingredients on packaged spice blends. They may contain salt or salt products (like monosodium glutamate, MSG). Avoid processed meats, especially cured meats, bacon, hot dogs, sausage, bologna, ham, and salami. On salads, use oil and vinegar, rather than bottled dressings. The recommended daily intake of potassium is 3,500 mg a day for people without risk factors for excess potassium levels. Some people may need to take potassium supplements. However, people who already have kidney problems or who take medications that limit the kidney's ability to excrete potassium, such as ACE inhibitors, digoxin, or potassium-sparing diuretics, should not take potassium supplements and should be aware of excess potassium in their diet. You should discuss potassium intake with your provider. The salt-restrictive DASH diet (Dietary Approaches to Stop Hypertension) is proven to help lower blood pressure, and may have additional benefits for preventing heart disease and stroke. Effects on blood pressure are sometimes seen within a few weeks. This diet is not only rich in important nutrients and fiber but also includes foods that contain far more potassium (4,700 mg/day), calcium (1,250 mg/day), and magnesium (500 mg/day), and much less sodium (salt) than the typical American diet. Limit sodium (salt) intake to no more than 2,300 mg a day. Some people may benefit from reducing sodium intake to no more than 1,500 mg a day. Reduce saturated fat intake to no more than 6% of daily calories and total fat to 27% of daily calories. Include dairy products that are non- or low-fat. Low-fat dairy products appear to be especially beneficial for lowering systolic blood pressure. Eat nuts, seeds, or legumes (dried beans or peas) daily. Limit carbohydrates to 55% of daily calories. Limit daily dietary cholesterol intake to 150 mg.
Increasing fiber in the diet may help reduce blood pressure levels. 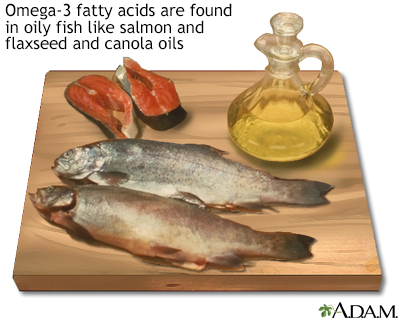 The omega-3 fatty acids docosahexaenoic acid (DHA) and eicosapentaneoic acids (EPA) are found in oily fish. Studies indicate that omega-3s from diet may have benefits for many medical conditions, including heart disease and hypertension. They help keep blood vessels flexible and may help protect the nervous system. Omega-3 fatty acids are also available in supplement form. But eating fish protects the heart more than taking fish oil supplements. Hypertension increases calcium loss from the body. 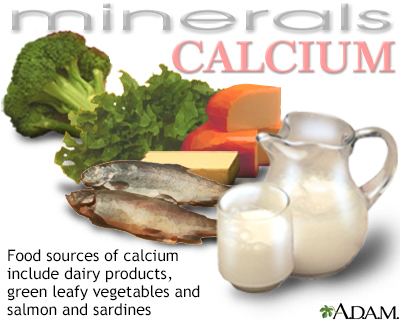 Calcium regulates the tone of the smooth muscles lining blood vessels. Studies have found that people who consume adequate dietary calcium on a daily basis have lower blood pressure than those who DO NOT. Consuming too much dietary calcium may have a negative effect. Some studies indicate that excess calcium intake (from dietary or supplement sources) may increase blood pressure and other heart disease risk factors. Even modest weight loss in overweight people, particularly in the abdominal area, can immediately lower blood pressure. When accompanied by salt restriction, weight loss may allow people with mild hypertension to safely reduce or go off medications. The benefits of weight loss on blood pressure are long-lasting. Regular exercise helps keep arteries elastic, even in older people. This ensures blood flow and normal blood pressure. Doctors recommend at least 30 minutes of aerobic physical activity on most days. Even brisk walking can be beneficial. High-intensity exercise may not lower blood pressure as effectively as moderate intensity exercise and may be dangerous in people with hypertension. Older people and those with uncontrolled hypertension or other serious medical conditions should check with their doctors before starting an exercise program. Everyone should quit smoking, especially people with high blood pressure and other heart disease risk factors. Certain sleep disorders, especially obstructive sleep apnea, are associated with hypertension. Even chronic, insufficient sleep may raise blood pressure in people with hypertension, placing them at increased risk of heart disease and death. Stress hormone levels increase with sleeplessness, which can activate the sympathetic nervous system, a strong player in hypertension. People who have chronic insomnia or other severe sleep disturbances may want to consult a doctor who specializes in sleep disorders. People with hypertension who are habitually poor sleepers should discuss with their doctors which blood pressure medications may help counteract the increase in blood pressure that occurs in the early morning hours. Stress reduction may help blood pressure control. Yoga, Tai chi, biofeedback, device-guided breathing, and relaxation techniques such as meditation may provide modest benefits for some people. Several classes of drugs are used to treat hypertension. Diuretics help the kidneys get rid of excess salt and water. Thiazide diuretics are the mainstays of anti-hypertensive therapy and are usually the first type of drug selected for most people with hypertension. Thiazide diuretics are especially helpful for treating older people (over age 60) and African Americans. (African Americans are more likely to be salt-sensitive, so they respond well to these drugs.) Diuretics are often used in combination with other antihypertensive drugs. There is strong evidence that diuretics work just as well as newer drugs in lowering blood pressure and are more effective in preventing heart failure, heart attack, and stroke.
. These include chlorthalidone (Thalitone, Clorpres), chlorothiazide (Diuril), indapamide (Lozol), hydrochlorothiazide (HydroDIURIL), bendroflumethiazide (Naturetin), methyclothiazide, (Enduron), and metolazone (Zaroxolyn). All of these prescription drugs are available in generic form. In most cases, thiazides are preferred to other diuretics for treatment of high blood pressure. Some providers fell that chlorthalidone has the best evidence for its use.
. These include amiloride (Midamor, generic), spironolactone (Aldactone, generic), and triamterene (Dyrenium, generic).
. Because loop diuretics act faster than other diuretics it is important to avoid dehydration and potassium loss. Loop diuretics include bumetanide (Bumex, generic), furosemide (Lasix, generic), ethacrynic acid (Edecrin, generic), and torsemide (Demadex, generic). Thiazide and loop diuretics reduce the body's supply of potassium (hypokalemia), which, if left untreated, increases the risk for arrhythmias. Arrhythmias are heart rhythm disturbances that can lead to cardiac arrest, although they rarely do. If you experience reduced potassium, your doctor will prescribe a lower dose of your current diuretic, recommend potassium supplements, or switch to a potassium-sparing diuretic either alone or in combination with a thiazide. Potassium-sparing drugs have their own risks, which include dangerously high levels of potassium in people with existing elevated levels of potassium or in those with damaged kidneys. However, all diuretics are generally more beneficial than harmful when their use is monitored. Thiazide diuretics may raise blood sugar levels and increase the risk for developing type 2 diabetes. Erectile dysfunction (impotence) can be an uncommon side effect of thiazides. Elevated uric acid levels, and possibly gout. Angiotensin-converting enzyme inhibitors (ACEIs) widen blood vessels and decrease the workload of the heart. They treat high blood pressure and can also help protect the heart and kidneys. An ACE inhibitor may be used as an initial blood pressure medication for non-black patients younger than age 60 years. ACEIs are also often used in combination with other anti-hypertensive medications. ACE inhibitors include captopril (Capoten, generic), enalapril (Vasotec, generic), quinapril (Accupril, generic), benazepril (Lotensin, generic), ramipril (Altace, generic), perindopril (Aceon, generic), and lisinopril (Prinivil, Zestril, generic). An irritating dry cough is a common side effect, which some people find intolerable. ACE inhibitors can harm a developing fetus and should not be used during pregnancy. Women who become pregnant should change from ACE inhibitors to another type of blood pressure drug as soon as possible. Women of child-bearing age who are considering becoming pregnant should also discuss other medications with their doctors. ACE inhibitors can increase potassium levels, particularly in people with kidney disease. ACE inhibitors protect against kidney disease, but they may also increase potassium retention by the kidneys. If potassium levels become extremely high (hyperkalemia), they can cause the heart to stop beating (cardiac arrest). This side effect is uncommon, except in people with significant kidney disease. Because of this risk, ACE inhibitors are not usually used in combination with potassium-sparing diuretics or potassium supplements. A rare but severe side effect is granulocytopenia, an extreme reduction in infection-fighting white blood cells. In very rare cases, people suffer a sudden and severe allergic reaction, called angioedema that causes swelling in the eyes and mouth and may close off the throat. People who have difficulty tolerating ACE inhibitor side effects are usually switched to an angiotensin-receptor blocker (ARB). ARBs, also known as angiotensin II receptor antagonists, are similar to ACE inhibitors in their ability to widen blood vessels and lower blood pressure. They may have fewer or less-severe side effects than ACE inhibitors, especially coughing, and are sometimes prescribed as an alternative to ACE inhibitors. In general, they are prescribed to people who cannot tolerate or DO NOT respond to ACE inhibitors. Losartan (Cozaar, Hyzaar, generic), olmesartan (Benicar) candesartan (Atacand), telmisartan (Micardis), eprosartan (Teveten), irbesartan (Avapro), valsartan (Diovan), and azilsartan (Edarbi). NOTE: ARBs should not be used during pregnancy. Calcium-channel blockers (CCBs), also known as calcium antagonists, help relax blood vessels. Along with thiazide diuretics, CCBs appear to work better than other drug classes for lowering blood pressure in African Americans. Diltiazem (Cardizem, Dilacor), amlodipine (Norvasc), felodipine (Plendil), isradipine (DynaCirc), verapamil (Calan, Isoptin, Verelan), nisoldipine (Sular), nicardipine (Cardene), and nifedipine (Adalat, Procardia). There are a number of combination medications that are available. Some include two antihypertensive medications, others contain a blood pressure medication and a cholesterol medication, for example. These may be more convenient for some patients, but do make it somewhat harder to change the doses of the component medications. Beta blockers help slow your heart rate and lower blood pressure. They are usually prescribed for people who have hypertension and CAD or heart failure. Brands include acebutolol (Sectral, generic), metoprolol (Lopressor, generic), and carvedilol (Coreg, generic). These drugs can have serious side effects and must be used carefully. Most important, suddenly stopping a beta blocker drug can potentially cause a heart attack. Your doctor will need to slowly decrease your dose before you can stop taking this medication. Alpha blockers such as doxazosin (Cardura, generic), prazosin (Minipress, generic), and terazosin (Hytrin, generic) help widen small blood vessels. They are generally not used as first-line drugs for high blood pressure, but are prescribed if other drugs DO NOT work or as add-on medication. Vasodilators help open blood vessels by relaxing muscles in the blood vessel walls. These drugs are usually used in combination with a diuretic or a beta blocker. They are rarely used by themselves. Brands include hydralazine (Apresoline, generic), clonidine (Catapres, generic), and Minoxidil (Loniten, generic). Some of these drugs should be used with caution or not at all in people who have angina or who have had a heart attack. Aliskiren (Tekturna, Amturnide) is a new kind of antihypertensive drug called a direct renin inhibitor. It blocks renin, a kidney enzyme associated with high blood pressure. Aliskiren is also available in the 2-in-1 combination pills Tekturna HCT (aliskiren and the diuretic hydrochlorothiazide) and Tekamlo (aliskiren and the calcium channel blocker amlodipine). Aliskiren is prescribed either alone or in combination with other blood pressure medications. However, people with diabetes or kidney impairment should not take aliskiren along with ACE inhibitors or ARBs because of increased risk for kidney damage and other problems. Aliskiren should not be used during pregnancy as it can cause injury or death to the fetus. Alderman MH, Davis BR, Piller LB, et al. Should antihypertensive treatment recommendations differ in patients with and without coronary heart disease? (from the antihypertensive and lipid-lowering treatment to prevent heart attack trial [ALLHAT]). Am J Cardiol. 2016;117(1):105-115. PMID: 26589819 www.ncbi.nlm.nih.gov/pubmed/26589819. Baker-Smith CM, Flinn SK, Flynn JT, et al; SUBCOMMITTEE ON SCREENING AND MANAGEMENT OF HIGH BP IN CHILDREN. Diagnosis, evaluation, and management of high blood pressure in children and adolescents. Pediatrics. 2018;142(3). pii: e20182096. PMID: 30126937 www.ncbi.nlm.nih.gov/pubmed/30126937. Brook RD, Appel LJ, Rubenfire M, et al. Beyond medications and diet: alternative approaches to lowering blood pressure: a scientific statement from the American Heart Association. Hypertension. 2013;61(6):1360-1383. PMID: 23608661 www.ncbi.nlm.nih.gov/pubmed/23608661. Chamberlain JJ, Rhinehart AS, Shaefer CR Jr, Neuman A. Diagnosis and management of diabetes: synopsis of the 2016 American Diabetes Association standards of medical care in diabetes. Ann Intern Med. 2016;164(8):542-552. PMID: 26928912 www.ncbi.nlm.nih.gov/pubmed/26928912. Flynn JT, Kaelber DC, Baker-Smith CM, et al; SUBCOMMITTEE ON SCREENING AND MANAGEMENT OF HIGH BLOOD PRESSURE IN CHILDREN. Clinical practice guideline for screening and management of high blood pressure in children and Aadolescents. Pediatrics. 2017;140(3). pii: e20171904. PMID: 28827377 www.ncbi.nlm.nih.gov/pubmed/28827377. Go AS, Bauman MA, Coleman King SM, et al. An effective approach to high blood pressure control: a science advisory from the American Heart Association, the American College of Cardiology, and the Centers for Disease Control and Prevention. Hypertension. 2014;63(4):878-885. PMID: 24243703 www.ncbi.nlm.nih.gov/pubmed/24243703. Moyer VA; U.S. Preventive Services Task Force. Screening for primary hypertension in children and adolescents: U.S. Preventive Services Task Force recommendation statement. Ann Intern Med. 2013;159(9):613-619. PMID: 24097285 www.ncbi.nlm.nih.gov/pubmed/24097285. Siu AL; U.S. Preventive Services Task Force. Screening for high blood pressure in adults: U.S. Preventive Services Task Force recommendation statement. Ann Intern Med. 2015;163(10):778-786. PMID: 26458123 www.ncbi.nlm.nih.gov/pubmed/26458123. SPRINT Research Group, Wright JT Jr, Williamson JD, et al. A randomized trial of intensive versus standard blood-pressure control. N Engl J Med. 2015;373(22):2103-2116. PMID: 26551272 www.ncbi.nlm.nih.gov/pubmed/26551272. Tinetti ME, Han L, Lee DS, et al. Antihypertensive medications and serious fall injuries in a nationally representative sample of older adults. JAMA Intern Med. 2014;174(4):588-595. PMID: 24567036 www.ncbi.nlm.nih.gov/pubmed/24567036. Turner JR, Viera AJ, Shimbo D. Ambulatory blood pressure monitoring in clinical practice: a review. Am J Med. 2015;128(1):14-20. PMID: 25107387 www.ncbi.nlm.nih.gov/pubmed/25107387. Victor RG, Libby P. Systemic hypertension. In: Mann DL, Zipes DP, Libby P, Bonow RO, eds. Braunwald's Heart Disease: A Textbook of Cardiovascular Medicine. 10th ed. Philadelphia, PA: Elsevier Saunders; 2015:chap 44. Whelton PK, Appel LJ, Sacco RL, et al. Sodium, blood pressure, and cardiovascular disease: further evidence supporting the American Heart Association sodium reduction recommendations. Circulation. 2012;126(24):2880-2889. PMID: 23124030 www.ncbi.nlm.nih.gov/pubmed/23124030. Williams B, Mancia G, Spiering W, et al. 2018 ESC/ESH Guidelines for the management of arterial hypertension: The Task Force for the management of arterial hypertension of the European Society of Cardiology and the European Society of Hypertension. Eur Heart J. 2018;39(33):3021-3104. PMID: 30165516 www.ncbi.nlm.nih.gov/pubmed/30165516.